Sgt. 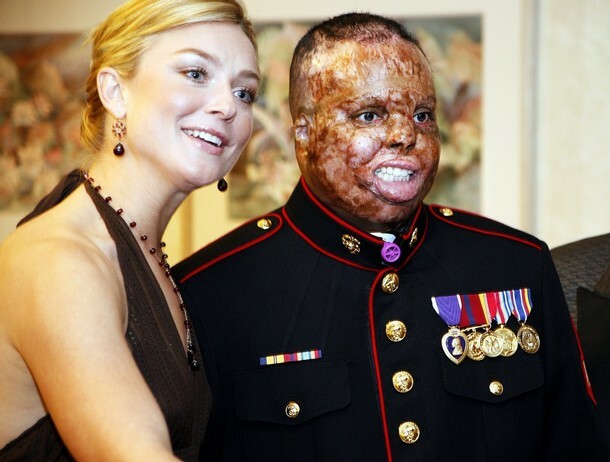 Merlin German was treated at Brooke Army Medical Center in San Antonio for burns to more than 97 percent of his body. Some people read my website and get upset because I tell them the truth. Our troops are exploited pawns being used to achieve global government. Here's what Henry Kissinger said about America's dedicated troops . . .
That's what our leaders think about the troops. This is what the elite think about the troops. Here's what senator John Kerry said about the troops . . .
What an insult to America's troops! Accordingly to John Kerry, being in the military is for lazy, poor and unfortunate young men and women. Over 5,000 troops are now DEAD!!! And shockingly, 1,339,771 Iraqis have been slaughtered in the U.S. war and occupation of Iraq. Alan Greenspan, who headed the Federal Reserve Bank for 19-years, stated that the Iraqi war is mostly about oil. The issue over supporting the troops is a hot potato. Many Christians are unquestioningly in support of America's military, regardless of how many innocent people are murdered. Americans still don't get it. The newsmedia has blindly led Americans to support tyranny, theft and mass-killings. I am not against serving one's country in the military; I am against the exploitation of our sons and daughters as paid mercenaries. I am not against the government; I am against evil and corruption. I am not anti-American; I love my country, but I am broken-hearted over the evil in our nation. For those believers who think Romans 13 teaches unquestioning loyalty to government, the Bible NEVER teaches Christians to offer blind loyalty to criminals. 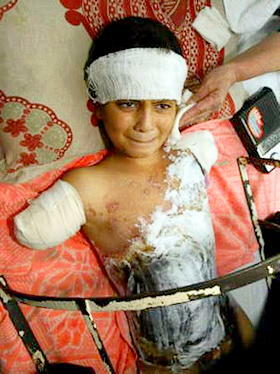 If we were the victims, then our attitudes would quickly and drastically change toward the Iraqi conflict. Look at the devastated child to the right. What if that were your child? Would you still support the troops? As long as Americans are comfortable, they won't care; but things are quickly changing. Tyranny is coming full-force to America. Massive poverty is coming. America is going to become as a third world nation. God's judgment is upon us. President Bush Jokes About War In Iraq!